strives to produce healthy, happy, well socialized puppies that meet the breed standard and ultimately will be a pleasure for you to own and dogs that we are proud to have bred. We're expecting a lovely litter! The Weimaraner, also known as a Grey Ghost, is a large, distinguished dog with beautiful lines and defined muscle, a Weimaraner is talented in many areas, including hunting, tracking, retrieving, pointing, search and rescue work and agility. An intelligent breed! Weimaraners are quick to learn, eager to please and obedient. 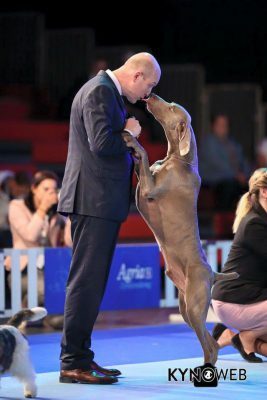 We are convinced, American weimaraners are the best companions for everybody who is well informed about the breed and ready to work with a dog. They fit in as lovely family companions (only for families who take lots of care about their socialization, at least basic obedience education and exercise requirements), as ideal companions for sportive, active people who love spending lots of free time in nature, or doing agility, rescue work,… and as outstanding hunting companions for hunters! On dog shows, their aristocratic presence makes them unbeatable in the ring! Dogs from our kennels are used in all mentioned parts. and sound in body and mind.